Host and chef Richie proudly surveys his chestnut and walnut pies made with gluten-free pastry. 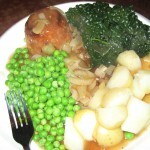 A tasty and hearty traditional vegan dinner with pie, peas, greens and potatoes. 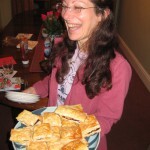 Host Lonnie brings joy to all with vegan, gluten-free puff pastries stuffed with custard, chocolate and caramel.